One of the Biblical stories that forms a central part of creationist beliefs is the supposed universal flood of Genesis. According to the account, the flood took place when Noah was 600 years old; the data provided by the genealogies in Genesis allow us to calculate that this would have been about 1,600 years after creation. If we assume the earth to have been created in 4004 BCE, the flood would have happened about 2348 BCE, around the time the pyramids were being built at Giza. Unsurprisingly, the Egyptian historical records of the period, which are reasonably full and complex, do not document a flood or the complete annihilation of population from the Nile valley. Nor is there any indication that in the years following the otherwise undocumented flood, the region was recolonised by a new population, the descendants of a Mesopotamian boat-builder and the animals he had rescued from the antediluvian world. Further afield, Chinese records make no mention of this universal flood. The archaeological record of the Indus Valley civilisation fails to show a mid-third-millennium hiatus. In Britain, the third millennium saw the development of Stonehenge from a simple banked enclosure to a complex arrangement of stones with no evidence that it languished for the best part of a year, half finished, under thousands of metres of floodwater. Nowhere in the world do we find archaeological evidence for any form of disruption to populations, cultures or settlement patterns at the required date. The sole piece of evidence used by creationists is the so-called ‘flood deposit’ found by Sir Leonard Woolley (1880-1960) at Ur in 1929. This is more probably explained as a result of silting in marshes towards the mouths of the Rivers Euphrates and Tigris at a time of a marine transgression, when the Persian Gulf extended further north than it now does than evidence for even a regional flood. There is simply no evidence from any part of the world to support the Biblical account of a worldwide flood in the third millennium BCE (or at any other time, for that matter!) that wiped out all humanity, land animals and birds, with the exception of eight people from Mesopotamia and the animals that accompanied them on the Ark and the recolonisation of the earth by their descendants. One response to the problem has been to re-date ancient sites, especially those of Egypt. Pointing out that pioneer Egyptologists in the early nineteenth century developed chronologies pushing back the start of pharaonic civilisation to before 5000 BCE and that the tendency since has been to reduce these chronologies to start around 3000 BCE, some suggest that it should be downdated still further. Dates as late as c 2250 BCE have been proposed by suggesting that the Old Kingdom (conventionally 3100-2150 BCE) and Middle Kingdom (2100-1750 BCE) were contemporary. This can only be done by manipulating lists of kings and other textual evidence; it is shown up as impossible by stratigraphy, where Old Kingdom remains always precede those of the Middle Kingdom on sites where both occur. In other places, it becomes necessary to discard radiocarbon and other scientifically derived dates. According to a story first published in 1940 in New Eden, a Los Angeles (USA) magazine, a ship-like shape had been discovered on the slopes of Mount Ararat by a Russian pilot, Lieutenant Vladimir Roskovitsky during the late summer of 1916, but although the story has long been known to be a hoax, it is still repeated by creationists, especially those dubbed “Arkeologists” by their critics. Attempts to salvage the story by suggesting that Roskovitsky was a pseudonym and that there were in fact two pilots (First Lieutenants Zabolotsky and Lesin of the Third Caucasian Air Division) take no account of the thirty-six year delay between alleged discovery and report. International tensions in the region following the Russian Revolution in 1917 prevented international exploration until 1948, although rumours that a detachment of Russian soldiers spotted it in the summer of 1917 and Soviet Major J Maskelyn sent an pilot and, subsequently, investigators to the location of ‘Roskovitsky’s’ discovery during the Second World War continue to circulate. An American team is said to have visited Ararat in 1948 but to have found nothing. Four years later, a French team led by Fernand Navarra (born 1915), a wealthy demolition engineer from Bordeaux, discovered the shape of a ship’s hull visible beneath the ice of a glacier, which proved to be nothing more than an unusual rock formation. He returned three more times (in 1953, 1955 and 1969). Wood samples he brought back have been radiocarbon dated to between around 1300 years old and 1700 years old: much too young to have come from Noah’s ark, which ought to be almost five thousand years old. Nevertheless, some authors continue to maintain that the radiocarbon date was determined as c 5000 bc. In 1960, Life magazine ran a story about an expedition to investigate the outline of what appeared to be a ship on the slopes of Mount Kalinbabada near Doğubayazit in eastern Turkey, rather than on Ararat itself. One scientist in the group offered the opinion that the phenomenon was too symmetrical to be a natural formation, but an intensive search of the site failed to produce any evidence for artificiality. Nevertheless, one of the photographs of the formation was captioned by the magazine as if to suggest that the phenomenon might be the remains of Noah’s Ark. The site remained a potential identification for believers in the literal truth of Genesis. Other searches placed Noah’s grounded Ark on its traditional location on Mount Ararat, further north. A 1975 Sun-TV special and its tie-in book, In Search of Noah’s Ark, by the “motivational speaker” and religious activist David (Dave) W Balsiger and Mormon television/film director Charles E (Chuck) Sellier proved to reawaken interest in the subject. 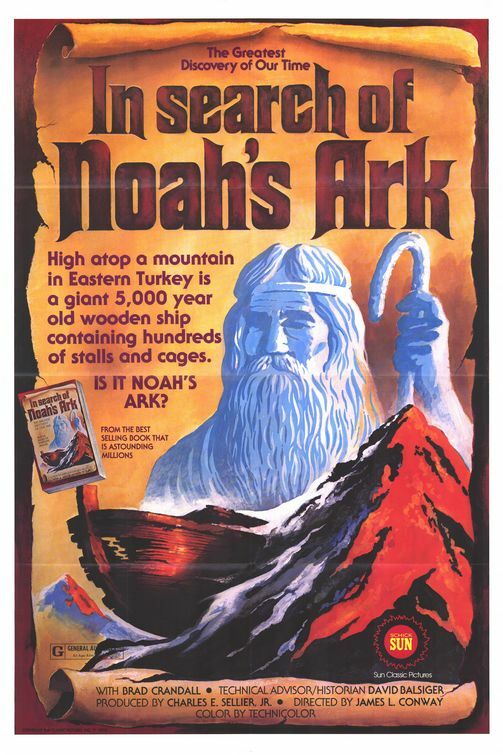 Many were convinced by the film, given a cinema release in 1976 such was its popularity, that something that could be regarded as the Ark had indeed been discovered in a remote location in Turkey. 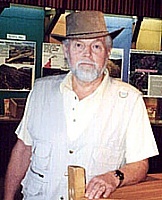 In the mid 1980s, another explorer, named Ron Wyatt (1933-1999), returned to re-identify the Doğubayazit formation with Noah’s Ark. He claimed that it contained large quantities of ‘gopher wood’, from which Genesis says the Ark was built. The Turkish Ministry of Cultural Affairs and the High Commission on Ancient Monuments declared the area a national park, allegedly to protect it from the unwanted attentions of looters. A number of supposed artefacts were recovered from the site and the surrounding area, including what was said to be an iron bracket. Microscopic studies showed that the ‘bracket’ was entirely natural and had formed from weathered volcanic minerals. The supposedly fossilized ‘gopher wood’ bark turned out to be metamorphosed peridotite. Ground penetrating radar surveys that were initially claimed to reveal metal-braced walls proved to show naturally occurring concentrations of limonite and magnetite in steeply inclined sedimentary layers. Fossiliferous limestone cutting across the syncline that forms the feature shows that the structure cannot have been Noah’s Ark according to the creationist rules because these supposed flood deposits are younger than the Ark, whereas it ought to have come to rest on top of them. Pierced cylindrical stones found at Kazan, traditionally identified as the anchor stones of the Ark, are local andesite and not minerals from Mesopotamia, where the Biblical story indicates that they should have originated. 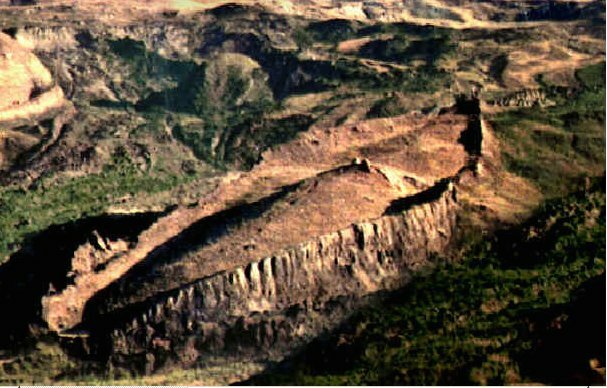 The Doğubayazit ‘Ark’ is beyond doubt an entirely natural formation and it is misleading of creationists to claim that there is evidence to show that it is a ‘fossilised’ ship. Ingenious explanations that it is the ‘imprint’ of the ship in the natural rock and that the ark itself has slid further down the mountainside to the location of ‘Roskovitsky’s’ discovery ignore several inconvenient facts: the Doğubayazit formation lies at an altitude of around 2000 m, 50 km south or Ararat, while ‘Roskovitsky’s’ discovery lay at an altitude of around 3500 m on the northern slope of the mountain; the Doğubayazit formation has a pointed ‘prow’, while ‘Roskovitsky’ saw a barge-like object with squared-off ends. However, these logical inconsistencies do not deter Arkeologists, even though many now dismiss the work of Ron Wyatt (who, incidentally, claimed to have identified such important archaeological discoveries as the wheels of chariots from pharaoh’s army on the bed of the Red Sea, the pillar of salt that was once Lot’s wife or Noah’s house). Nevertheless, creationists continue to search for the remains of Noah’s Ark, despite the overwhelming consensus of biblical scholars that the story in Genesis is not the original version of the story. In January 2009, it was announced that Dr Randall Price, a lecturer in Judaic Studies at the fundamentalist Liberty University, Virginia (USA) would be taking an expedition to Turkey to search Mount Ararat for the remains of Noah’s Ark. In twenty-five years of searching, he has visited Turkey more than thirty times and, in 2008, he met a Kurdish shepherd who claimed to have seen the Ark as a boy. In September 2008, the shepherd led Price to the location but found that it was covered by boulders, which they estimated to be some sixty feet (18.3 m) deep. He estimated that he would need about $60,000 to pay for an expedition to remove the boulders and locate fragments of the Ark. So, in the spring of 2009, he set out again. In a news release, he updated his progress by 28 December 2009. Despite the upbeat tone of the piece (“we’d like to think it’s Noah’s Ark, we’re not sure what it is, but it’s in the right place”; whatever there is to be discovered, it should be found when he returns in the coming summer), it is obvious that he has nothing to show for his efforts (apart, one suspects, for a bank balance now depleted by $60,000 raised from where? The faithful?). Richard Bartholomew’s blog has a nicely dismissive piece on this latest attempt to fleece the faithful raise money for a worthy quest. The stories surrounding the Sumerian hero Gilgamesh include a Flood legend so like the one in Genesis (with a Noah character, Ziusudra, known to Ancient Greek writers as Xisuthros), that they are obviously a source for much of the Noah story. Even the most conservative estimates for the date of the Pentateuch place it at least a thousand years later than the surviving versions of the Sumerian story. In the Assyrian Epic of Gilgamesh proper, the survivor of the flood is called Utnapishtim, who landed on the Mountain of Nisir. There is also an Old Babylonian poem that mentions a universal flood, this time with a hero called Atraḫasīs or Ḫasīsatra. Most Biblical scholars (with the exception of Christian fundamentalists) agree that the ancient Hebrews adopted a flood story into their mythology at some point during a period of close contact with Mesopotamia, perhaps during the Exile or perhaps much earlier, in view of the differences between it and the Babylonian version. One of the investigators in the 1980s, David Fasold (1939-1998), quickly recognised that the feature near Doğubayazit is not Noah’s Ark, but an entirely natural, geological formation. However, as an interesting corollary, he suggested that it may well have been the very shape of the site that encouraged ancient populations to think of it as a ship and to invent the story of a Deluge to account for its presence 2,000 metres up a mountainside. Whilst this is an ingenious explanation, we do not know that Mount Kalinbabada, the location of the Doğubayazit formation, is the biblical Ararat or Assyrian Nisir, nor do we know that the shape of the formation that looks so boat-like today appeared equally boat-like four thousand years ago. If Noah’s ark ever existed it wouldn’t be found today as it would have likely been recycled into buildings and firewood. Think of it; You are Noah and his sons, you just spent years cutting down trees for timber, you disembark from the Ark and need lumber for new houses barns fences firewood etc. Of course you turn to the nearest most easy to get source of wood: the Ark! Even those who must believe in the literal truth of the bible aren’t thinking the whole thing thru. Uh. The entire flood account defies modern knowledge and logic. Don’t start using logical and critical thInking to just that bit, unless you’re willing to answer what the predators ate while on the ark and afterwards without making another species extinct, what the grazers ate after the water receded, how long it took plant life (not to mention mature forests) to regrow, how 5 mil species fit on the ark, how a wooden vessel of those dimensions remained intact etc. Whole lotta miracles need to be ascribed to cover the gaps…. Where in Iraq did Noah find a pair of penguins? The same place he found polar bears and bison. In Australia, where they were hanging out with the kangaroos, so all could be picked up in one go. Then he went to get the sloths from South America, those things just cannot follow a deadline. i believed that layers on side of the grand canyon was resulted from the great flood of Genesis. it may take it to be big to reach on top of the mountain and not just an ordinary flood from the river bank. So, if the layers visible in the sides of the canyon were deposited by the flood, how did they consolidate sufficiently for the erosion to take place? It clearly cut through solid rock, not sea bed sediments. I am a person who follows no religious dogma, and therefore do not take the stories in the Bible as fact. However, it seems only logical that many of the stories were based on fact. Before the written word, history was remembered and repeated in an oral tradition. While we all know of that whispering game children play called “Telephone,” where a phrase is whispered from one person to the next until it comes out at the end sounding nothing like the original, I think it’s pretty obvious that the oral tradition was very important to ancient peoples and there were members of the community who prided themselves in being able to remember stories and events word-for-word. There have been several “real” archeological investigations into floods around the world, such as the Black Sea flood which occurred about 7,000 years ago (http://www.nationalgeographic.com/blacksea) and the North American flood of 8,400 years ago (http://www.sciencedaily.com/releases/2007/12/071216124230.htm). It seems likely that these enormous events would have left an impression on the people of the time, and would be something they would want their descendants to know about. The Navajo have a legend (http://www.firstpeople.us/FP-Html-Legends/TheFourthWorld-Navajo.html) about their people coming out of the Third World, which had flooded, through a reed into the Fourth World. While I am pretty sure they didn’t come up through a reed, I am confident that their story is based upon the real flood. Native Americans have been in North America for 12,000 to 20,000 years. Would anyone like to comment? Not just actual floods that took place, but modern archaeologists tend to dismiss that there may have been contemporary “archaeologists” in the past. If we can find marine fossils on the slopes of high mountains, there is a good chance that ancient peoples did as well, only their knowledge of the age of the earth, plate tectonics, and other geophysical properties would have led them to come up with other explanations for such a find—a process that could explain much of cryptozoology, and a plethora of ancient myths, such as the Loch Ness monster, or dragons. I wrote a detailed comment-response to this article, hit the submit button and it erased all my work saying that I had an incorrect ‘captcha phrase’ but no ‘cptcha phrase was shown. What is going on? Good question: I’ll look into it. You fundy atheists are funny!! There’s nothing fundamentalist about me. If you want humour, look at some religious fundamentalists. When they’re not being side-splittingly funny as a result of their stupidity, they become quite scary. I don’t see why Devon thinks that following a rational, reasoned methodology means atheism. As far I have read, none of the contributors has said anything about God, or made any claims for His/Her Existence. There have been, and still are, many good archaeologists who have had faith in a deity. To a certain (largely fundamentalist) mindset, any criticism of the biblical account or any suggestion that it might not record accurately genuine history is seen as “atheistic”. This shows huge ignorance of the variety of interpretations of biblical texts by both Jews and Christians over millennia: the biblical literalism of those who want every jot and tittle of Noah’s implausible story to be true is a rarity among the various interpretations of the text. Noah’s Ark would not be boat-shaped. It was an “ark”, that is, a wooden box. (Just like the “Ark of the Covenant” is a box, not a boat.) It describes its shape and dimensions right there in the Old Testament. and that would do away with faith as well, being as the Ark would prove the Bible to be correct. I had always gotten the impression that the formation on the slopes of Mount Kalinbabada was at least partially the inspiration for the Ark story. The formation looks vaguely like a large boat, so some local made a fantastical story around it. That’s the kind of thing people back then did, right? Absolutely. I imagine that an element in the development of a world-consuming flood story was some kind of aetiological myth. The scenario would be something like “Wow, that looks like a boat! It must have got up here during a really bad flood”. The ark will never be found, no matter how much money the faithful pour into the pockets of explorers. You cannot find what does not exist. I’d like to see your comment, mr. Fitzpatrick-Matthews, on Angela Conti’s comment on the various Large Floods that have happened. There’s the emptying of the huge glacial sea in North America that created The Badlands (but, that might have been before there were any humans living there…). I have read/heard about those aforementioned floods. Do you think they could have been incorporated into those Genesis-myths? You could find a very, very detailed answer to your question in Sir Henry Howorth’s exhaustive study, THE MAMMOTH AND THE FLOOD, (1887), a copy of which you could procure from the Science Frontiers web site, that William Corliss presided over for years, until his passing, not long ago. Sir Henry requested that people not criticize his arguments until they took the time to make a careful review of them. The ice age theory that the Mammoth Age ended 12,000 years ago — with frozen elephants at the Equator, is as fantastic as there being seven pairs of every clean animal on Noah’s ship. (Cf. Ge 7:2) Heyerdahl’s placement of the Noachian Deluge at approximately 3,114 B.C. is very probably a close estimate, being not long before the advent of the first cities on the planet. Sir Henry noted that some parts of the globe were probably spared, yet the cataclysm involved huge shifts to the crust of the earth, owing, no doubt, to intense and far-reaching volcanic activity, that resulted in the uplifting of entire mountain systems; and, consequently, the generation of unimaginable continent-crossing tidal forces. We thus ought well to be concerned about the present pace of global petroleum extraction, (a lubricant), that will total one trillion barrels over the next thirty years. The problem with using texts that are more than a century old is that they rely on less data than are available to us today. Nineteenth-century writers also had been exposed to fewer explanatory hypotheses against which to test their data. I suggest you read these reviews published just after the book. I fail to see what is fantastic about the idea of an ice age. Where does the information about “frozen elephants at the Equator” come from? Is it in Howarth’s book? And what is your source for Heyerdahl’s date of Noah’s flood? Is this the anthropologist Thor Heyerdahl or someone else? Howarth’s explanation for accumulations of bones of Pleistocene mammals makes the unwarranted assumption that there must be a single explanation operative in all cases, in his view, floodwater. Why should there be a single explanation? Should not every case be examined on its own merits? When Buckland excavated at Cresswell Crags in the nineteenth century, he was convinced that the bones he found had been deposited in the caves by floodwaters. We now know, from the evidence of things like butchery marks, the incompleteness of the assemblage and evidence for human activities within the cave that the most plausible explanation is that the bones are the residue of food consumption by humans and other carnivores. If you want a long explanation about why a universal flood along the lines of Noah’s flood is simply impossible, read this. See THE TIGRIS EXPEDITION, by Dr. Thor Heyerdahl, re: the dating of the Flood by that anthropologist. “Of every clean animal take with you seven pairs . . . ” (See Gn 7:2) This statement differs from the number given in the previous chapter. It is the opinion of some scholars that two versions of the Genesis Flood story have been woven into one. There are other details of the story that are not known to those who haven’t thoroughly studied this history. The notes in at least three different Bible texts explain that the original Hebrew describes a type of reed ship. Dr. Thor Heyerdahl, (who had three of these ships constructed), explained that the original ocean-going vessels on the planets were exclusively built on a compact reed hull — a crescent-shaped hull made of bundles of reeds. The term “gopher wood” is based on an unused Hebrew word, according to the STRONG’S CONCORDANCE — Hebrew Dictionary, that is on the Internet. The original Hebrew states that the ship, (“Ark” is a Latinized term), came to rest in the mountains (note the plural form) of Urartu, (or “Ararat”). This fact is lost on many people because of the mistranslation of revisionists.